David Agress Teams with 4Wall New York for CW Upfront | Press Center | 4Wall Entertainment, Inc.
New York, NY- Lighting Designer David Agress is no stranger to the pressures of designing for an Upfront presentation- a television network's once a year shot at introducing new television programs to advertisers. 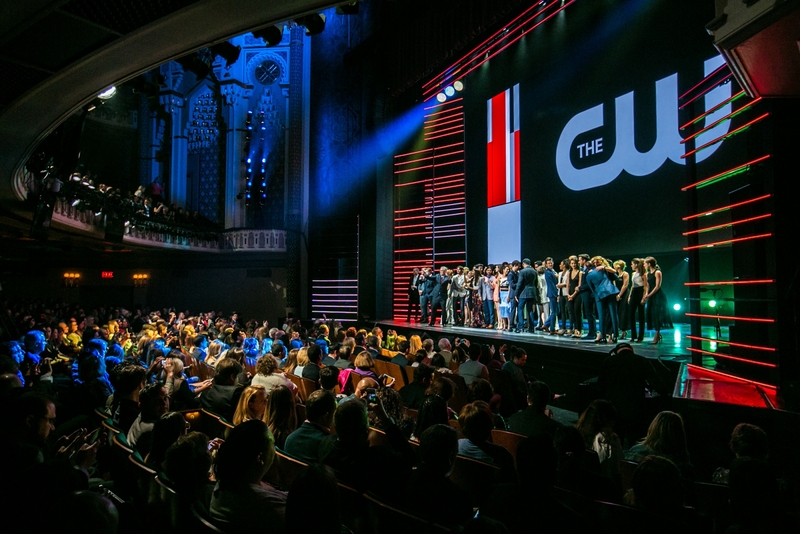 Agress has worked with the CW Network for more than twelve years, ensuring their yearly Upfront is one that features an exciting and inviting environment. As with any live show, Agress attempts to build a flawless and well-integrated presentation. The stars of this particular event are the executives and sales team members presenting their products. For the past few years, Agress has made the CW Network"s group of presenters look great in person, as well as on camera, using lighting gear from 4Wall New York. Agress spoke of the work on this year"s event, held at New York City Center in Manhattan. "The biggest challenge is to stand out from the crowd. In most cases an audience member for an Upfront is going to see many other presentations in a short time period," he said. "You want yours to be remembered and not just be part of the noise." The CW Network typically features programming aimed at a younger audience, such as last season"s breakout hit "The Flash", as well as mainstays like "Arrow" and "The Vampire Diaries". Agress sought to bring the youthful energy to the show"s looks again this year. "You want to tap into that youthful vibe and interpret it with lighting," he said. Agress contacted 4Wall knowing he needed one particular fixture for this year's event, the Clay Paky B-Eye K20 Wash.
"When I first saw the B-Eye, I said this was going to be the light to have. The CW Upfront was the next show on my calendar and I called 4Wall immediately. They assured me they had ordered them and would have at least a dozen for me to use. I love this light. Besides doing all the unique visual tricks it offers, it is an incredible workhorse of a fixture." Needing to light a live concert element during the presentation as well, Agress also added Martin MAC 700 Profiles- a fixture capable of fitting easily into the Balcony Rail at City Center- as well as Martin MAC Auras. The Auras provided over-stage back-light as well as moving light tricks. "The Aura can fit anywhere because of its small size, and can move really fast because it"s so lightweight," said Agress. Working closely with the producers, creative agency Hotopp Associates, scenic designers, and more, Agress ensured the lighting integrated with video and content elements, as well as scenery, to create a cohesive result the CW Network could be proud of. Agress also commended 4Wall New York for the quality of equipment used on the show. "4Wall always seems to be going above and beyond for me. They have what I want, which is the latest gear in great shape. The staff has a can-do attitude that instills confidence. If they say or promise something it"s going to happen. A lighting design is created with specific gear in mind, and the backbone of the lighting is the shop. You have to be able to count on your shop and I do count on 4Wall." For more information on David Agress, his official site here.